The first thing to do, after you have accessed the web application, is to create a data provider. 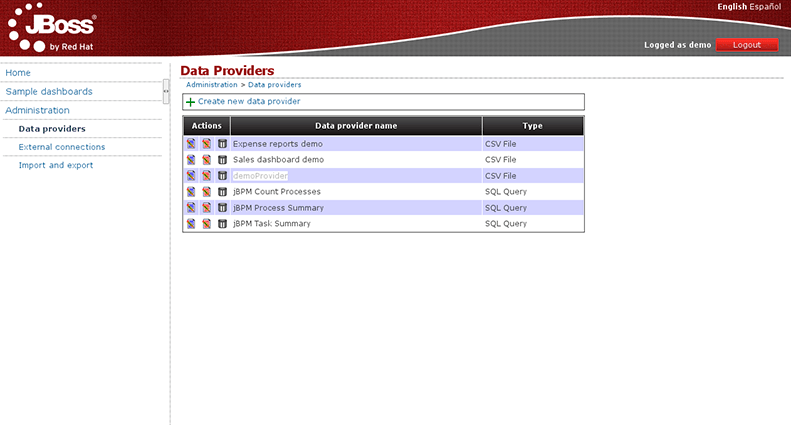 On the left menu, go to ‘Administration > Data providers‘ and once there, select the option ‘Create new data provider‘. The purpose of data providers is to gather information from any system, either a database, a file or any other, and transform it to the internal in-memory representation for building dashboards. As you may guess there exists different data sources and therefore different ways to retrieve as we’re going to see next. 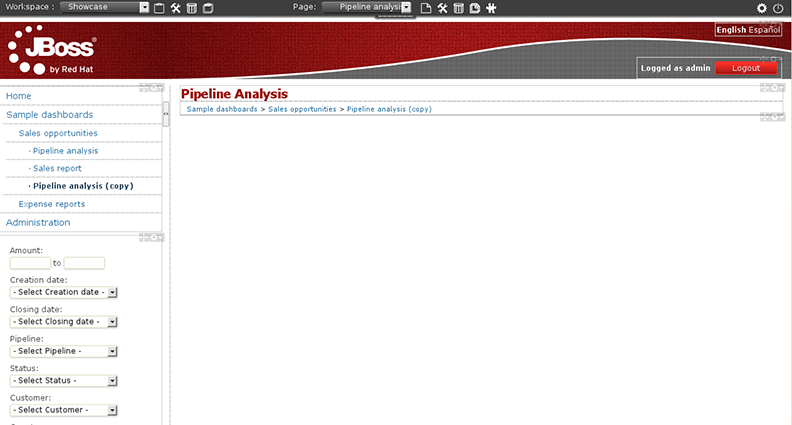 Once you have filled all the fields, click on ‘Try’, to check that everything works properly. The application will give you a message ‘Correct data set ...’ and we continue by pressing ‘Save‘. You can create a data provider to query a relational database. 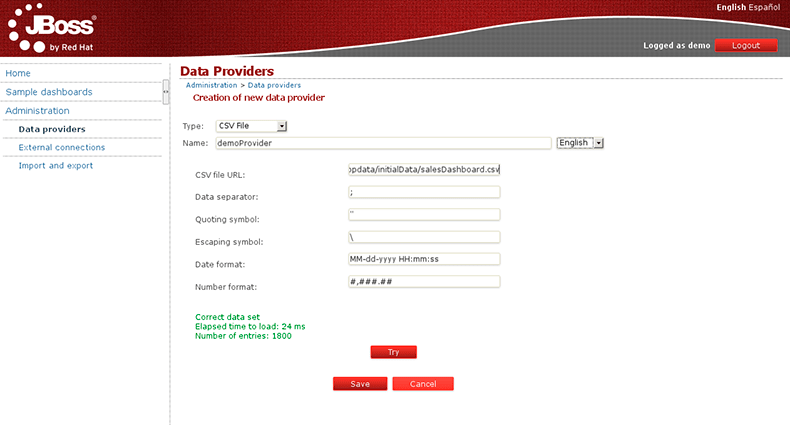 Go to Administration > Data providersand click on ‘Create new data provider‘. 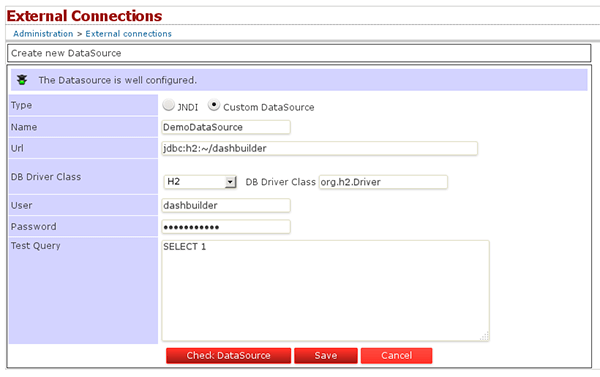 Choose the ‘SQL Query‘ option and fill the form with the data provider name and the SQL query that will retrieve the data. 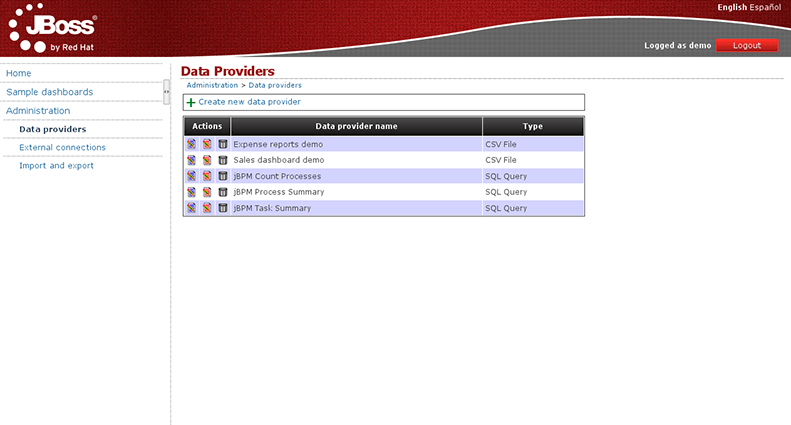 In this form you have the ability to select the data source where the data comes from. By default the local data source is selected but you can define new connections to external data sources. To do this you should go to the ‘Administration > External connections‘ section and from there you can create a new data source connection. Let’s get back to the creation of our SQL data provider. Once the data source has been selected and the query is typed in, you can click on the ‘Try’ button, and if the query is successful you will get the following message. The previous sections showed how data could be loaded from plain text like CSV files or query from a database connection. When data is small enough, Dashbuilder can handle pretty well the small data sets in memory as far as it doesn’t exceed the 2MB size limit. However, must of the time, our data sets are bigger and we can’t upload all the data for Dashbuilder to handle it by its own. Is in these cases where database backed queries can help us to implement nice drill down reports and charts without preloading all the data. What we’re going to start discussing next is the two strategies we can use for building a dashboard. This is an important aspect to consider, specially if we’re facing big data scenarios. 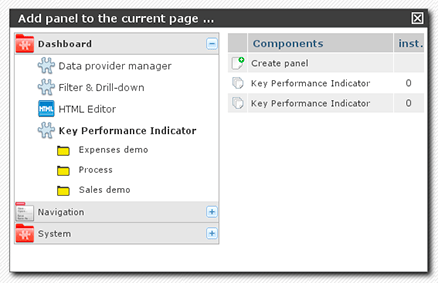 To add a new ‘Key Performance Indicator‘, click onDashboard > Key Perfomance Indicator. 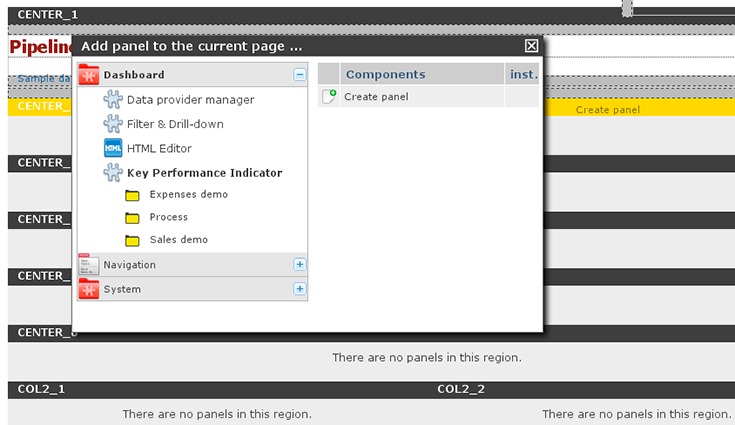 Drag the ‘Create panel‘ option and drop it into any of the page regions. You will see that they are being highlighted while you move the mouse over them, then simply drop the panel. Domain (X Axis): The data column that is taken as the X axis. In this example, we choose the property ‘Country’. 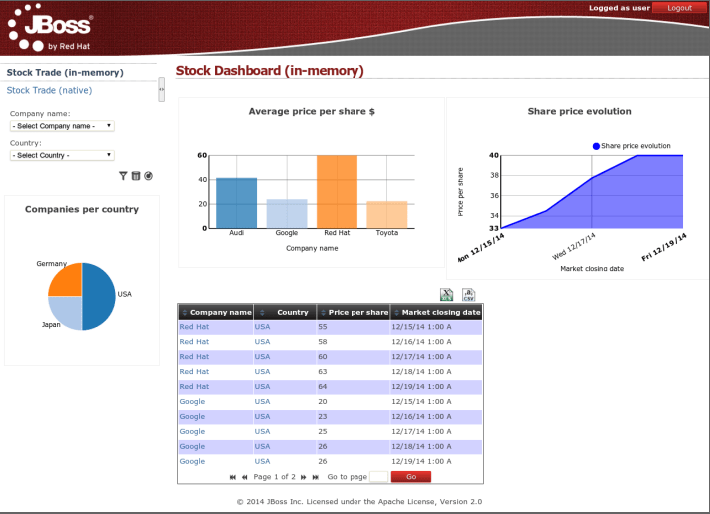 Range (Y Axis): Information to be grouped and aggregated for every domain interval. For example: ‘Amount’. Renderer: The rendering library to use. Each one provides different features and visualization style. By default ‘NVD3’. Sort intervals by: It’s how the domain values can be sorted, for example, according to its range value. To finish the panel edition just close the panel edition window. 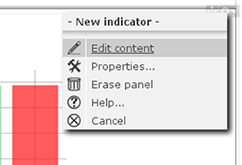 If you want to get back again, just click on the right upper corner of the panel area and select the ‘Edit content‘ menu option. The system provides you with 3 types of chart displayers: bar, pie and line, and a special table displayervery useful to create tabular reports. 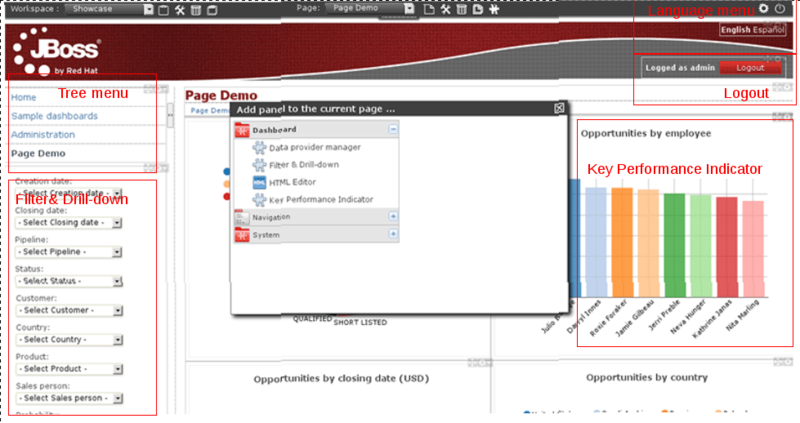 The system also comes with 2 rendering engines: NVD3 (pure HTML5/SVG technology) and a Flash based one, Open Flash Chart 2. Each renderer has its own available features, so depending on the type of chart and renderer choosen you can end up with some display features enabled or disabled depending the case. 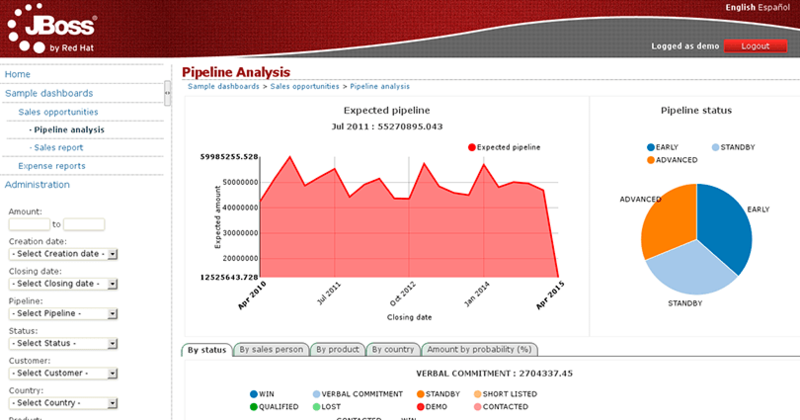 For instance, the ‘Paint area‘ feature is not available for OFC2 line charts. Skin: This will select and specific look’n’feel and CSS stylesheet for this page. You can leave the default value. Region layout: This is the template, that is, how regions are organized to place the panels inside the page. 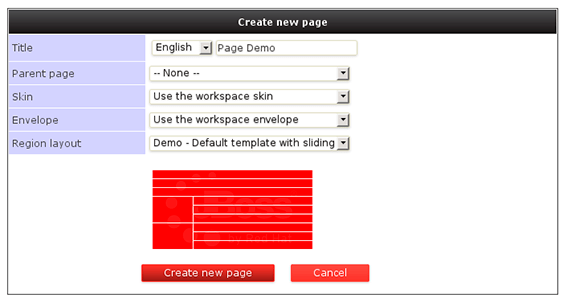 We can choose any of the installed types, for example, “Demo – Default template with sliding”. 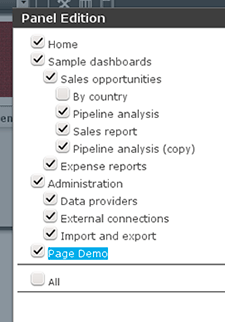 If you want this page to be shown in the left menu, you can click on ‘Edit content’ and then add the newly created page to the list of options displayed in the menu. As mentioned earlier, another way to create new pages is to copy an existing one. We can do that via the ‘Duplicate current page‘ icon which is a much faster way to create pages. After clicking on the clone icon located at the toolbar, a page similar to the image below will be shown. From there we can select those instances we want to duplicate and those we want to keep as is (to reuse). Once finished, press the ‘Duplicate page‘ button and a brand new page will be created with the same name as the original one but starting with the prefix ‘Copy of‘. Notice that if a panel instance is reused then any changes made to it will be reflected on all the pages where such instance is being used. this is a cool feature when we are defining for instance our navigation menus since we can define a single‘Tree menu’panel and then configure all the pages to display the same menu instance. 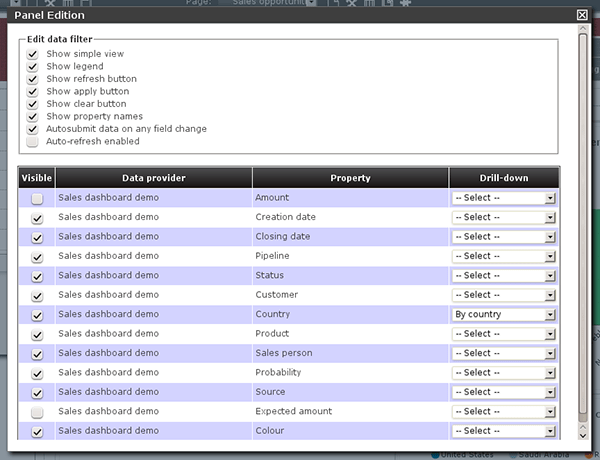 This is a filter configuration panel where we can set the filter behaviour. Let’s focus first on the middle bottom part of the screen: the Data provider’s property table, which lists the properties of ALL the data providers referred by the KPIs on the page. 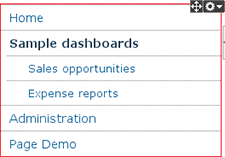 For example, if we are building a sales dashboard and all its KPIs are built on top of the same data provider called ‘Sales dasboard demo‘ then the system lists all thedata properties of the ‘Sales dashboard demo ‘ provider. Hence, only the properties we select as ‘Visible‘ will be part of the filter form. Aditionally, we can enable the drill-down feature for each property. If enabled then the system will redirect to the target page when the property is selected on the filter form. 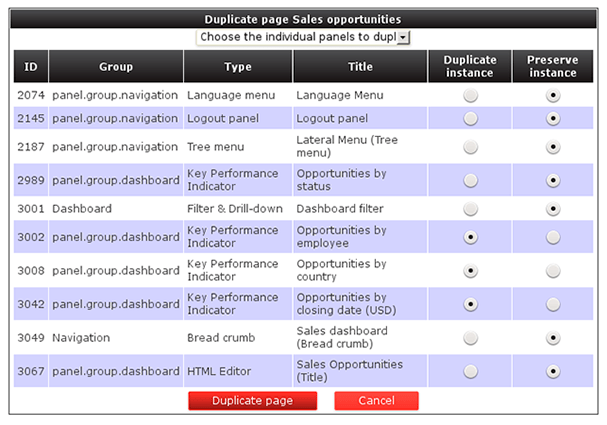 Below is an screenshot of the filter panel of the ‘Sales dashboard demo‘. This entry was posted in Business Metrics, Integration, Knowledge, Problem solving, Programming, Uncategorized. Bookmark the permalink.